Squat Thrust – With your dog in a sit, have them stretch to a treat in your hand directly above their head. The treat should be positioned such that they move straight upward, keeping both hind paws on the ground. They should then recoil back into the sit position. Give them the treat every time. You can also use a hand touch instead of a treat lure. Good for hind end strength. Do this exercise 10 times. High Five – First, teach your dog to handshake. When they do that reliably with both their left and right paws, you can move your hand higher so they have to stretch farther to place their paw in it. Good for shoulder strength and reach. Do this exercise ten times on each side. Snoopy – Pick up one front paw (right) and then reach back to pick up one opposite rear paw (left). They should now be balancing on two legs. Gently rock them back and forth and side to side. Good for core strength and balance. Do for ten seconds and then change sides. Stay – Practice the 3Ds of your stay (Duration, Distance, Distraction). Have them down stay for 3 minutes (duration). Have them sit stay while you walk into another room and return (distance). Have them hold either position (sit or down) with a ball placed in front of them. Release them to get it (distraction). Changing sides – Practice your front and rear crosses in the living room. That’s right! Front Cross – start with them on your left and begin walking forward. Put your right hand in front of their nose and make a 90 degree turn, having them follow your right hand. You have effectively switched sides. Now, start with them on your right and switch to your left. Rear Cross – same as above, but say “go” and have them move ahead of you. When they move forward, step behind them. You are looking for their head to switch from one side to the other, not to make a circle around. 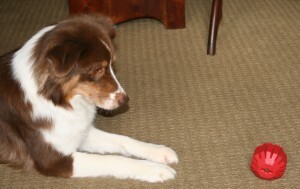 Recall – Your dog is moving toward you and the target plate. Send – Your dog moves away from you to the target plate. With – Your dog is running with you toward the target plate.